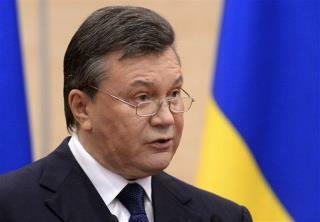 (Newser) – Ousted Ukrainian president Viktor Yanukovich blasted his country's new government today as a "gang of fascists," saying that it was paving the way toward civil war. Speaking from Russia, Yanukovich said he was still commander-in-chief and that "I will be back in Kiev," and called on Ukraine's military to refuse to do the bidding of interim leaders, the New York Times reports. He cited concerns those leaders could call for action against Russian-speaking parts of the country, the AP notes, and dismissed a planned May election as "illegal." As for the West, "you do not have any legal grounds to provide financial assistance to these bandits" currently in charge, he said. Regional lawmakers in Crimea have approved a "declaration of independence of the Autonomous Republic of Crimea." If locals vote Sunday to join Russia, Crimea becomes an independent state, the document says. But Western countries have already said they won't officially recognize that vote, the AP notes. Acting president Oleksandr Turchynov has called on MPs to form a National Guard out of Interior Ministry troops. The goal: "to defend the country and citizens against any criminals, against external and internal aggression." Taking control of a Ukrainian military base in Crimea, some dozen Russian-led troops fired in the air, a Ukrainian defense official says. No one was hurt. Ukrainian activists seeking to enter Crimea say they faced off with men in riot police uniforms—which are now banned. One activist was hit in the chest with what appeared to be a rubber bullet, Reuters reports. NATO is set to begin reconnaissance flights on Crimea's eastern border today, while the US launches previously scheduled military training exercises nearby. Can someone please tell these people that living in an ethnically pure country with only people of the same ethnicity, religion etc. is a stupid idea? Boom! I just solved Crimea, Israel, Palestine, Afghanistan, Iraq, Sudan, and republicans. You're welcome. (R) 2016 Gov. RICK PERRY Report: How much courage of Mrs. Yulia Tymoshenko will sign a NATO treaty to deploy the NATO alliance troops and missiles to station in Ukraine ? Trying hard to ignite a civil war and fail I see. Good. Yeah go ahead fly over but one of SAMs might malfunction in such "unstable situation". Don't run to U.N crying and saying they didn't warn you.